Labels: identify the person, the person..
4. Ray Kroc- The guy who took over McD and made it a fast food chain!!! 5. 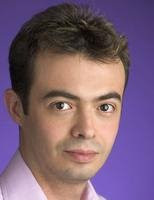 Buyukkoten- The S/W engineer who created orkut! But I found a loop-hole in your quiz to pull this one!! Frankly- I knew only 3 and 4. Very very informative. I learnt and read about all personalities you have mentioned here. Thank-you!!! @ sameera thank u--pleasure is all mine .